This is an initial audience analysis for my web documentary proposal on homelessness. Why are you creating this story? Goals, rationale, purpose, premise? What do you want your audience to experience or understand? The story I want to explore is changing focus as I undertake research into the issues of homelessness. 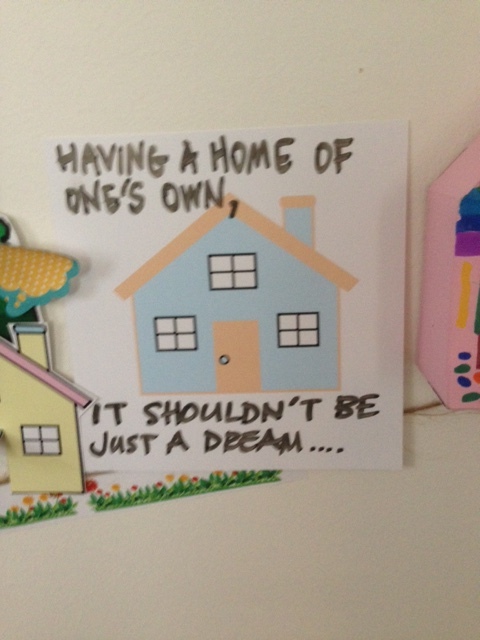 See my recent blog post on this at https://sharedfragments.com/2015/08/07/what-is-homelessness/. I would like this documentary to explore this further and show that homelessness is not just about sleeping rough. Rather it’s about not having a safe or secure home and that people living in shelters, rooming houses, caravan parks on friend’s sofas are all homeless. Many of them are under 25 and many are women with children. In the light of this research, the goal of this web documentary will be to explore and show the many different faces and experiences of being homeless. What is your story? In what way will it be original, surprising, human, passionate, truthful or relevant to your audience? The documentaries I have seen so far on homelessness focus on those sleeping rough so I want to show a general audience that this is far from the case. The work will be made up of interviews with those experiencing homelessness or who have experienced it and the service providers who support them. The work will be honest, spoken from those who know, it will surprise and educate viewers. But it will also give a voice to those who are not currently represented in the homelessness narrative. Ideally the work would provide some kind of call to action which, from my initial discussions with the sector would really welcomed. This could involve working in partnership with a small service provider who doesn’t have the funds to undertake a media campaign but which would see direct benefits from the documentary on their work . Where will you publish your story? What platform/s and hardware are suited to your audience? E-books, blogs, videos, photos, podcasts, tweets, status updates, apps, games, forums, websites? There is a very significant Facebook engagement around the area of homelessness. 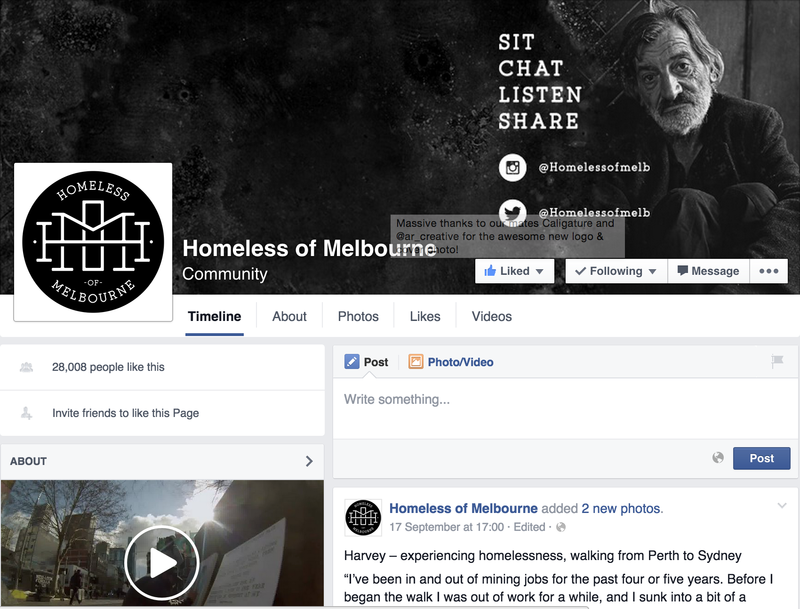 A key Facebook community Homeless of Melbourne has 26,000 likes. 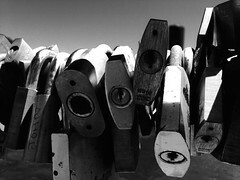 A key activity of this site is posting photos and transcripts of interviews with homeless people in Melbourne. Users of this site respond actively to these posts many offering direct action such as providing support, money and specific things such as concert tickets. In my work last semester in Collaborative Media I worked on building a community through Facebook. What I found was the challenge of building a large and engaged community. I also discovered through my research that filmmakers are more and more connecting with existing communities around a particular topic and engaging in dialogue directly with those communities to find both participants and a potential audience (Jenkins, Ford and Green, 2012:252). Given this existing large and active online community I am really keen to engage directly with this community via these Facebook pages. This would build interest in the project and hence build a potential audience. As the work will be created around interviews the final interviews could be published as modules on the Homeless of Melbourne page with agreement from those who manage it. This could be the initial place for presenting the content. The other platform will be to publish the work as a web documentary where the content would be videos and images delivered in modules most likely around the different modes of being homeless (rough sleeping, rooming houses, couch surfing, caravan parks, service providers). This could be as simple as posting the videos to YouTube with links or creating a YouTube channel or it could involve building a website specifically to deliver the content. The will depend a lot on the skills and resources I have available. Who is your audience? Who is your target viewer/user – i.e. the group you will target in promoting the work? The audience type that this work would most likely attract are joiners and spectators, those defined by Forrester as people who use social networks, watch a range of online content and are aged from late teens to late thirties. I think that the audience age range would extend into those in their forties and fifties as this is also a social justice issue which engages a wide age group of both genders. In saying this there is a substantial following of people on a number of Facebook pages around homelessness and these are most likely to be people in the highest usage of social media which are those in their twenties and thirties. This audience is an educated aware audience with an interest in social justice issues. In general they will watch content on smart phones and laptops and will have good connectivity and download capacity. The other potential audience is homeless people but I feel that the documentary itself is not something that will be sought out by homeless people. Research shows that homeless people with smart phones use their phones for contactingmfriends and family, emergency and support services and medical assistance not to view video content or browse the internet. It also shows that staying connected is difficult (Humphry, 2014) and that accessing other online devices such as PC and laptops is also difficult. However the research also shows that 95% of homeless people have a mobile phone and of these 77% have smart phones (Humphry, 2014). Service providers I have spoken to say many homeless people access Facebook and one provider said that Facebook is most definitely the place to work in if you want homeless people to see the content. This again suggests that a connection with Homeless of Melbourne will be a really good way to connect with those experiencing or who have experienced homelessness. When will you create the content and start to engage your audience? What is the production process and publishing schedule? From my initial discussions with people in the area a major aspect of this documentary would be engaging with the community, getting involved by perhaps volunteering and spending time meeting and talking with people before doing any filming. Homeless people are vulnerable, hurt, wary and time is needed to build trust. Once I know that this project will be one that continues this semester I would start making these connections. I would also make use of the CHP bi-annual conference to be held in Melbourne in September to talk with people and make contacts. I would also connect with the Homeless of Melbourne Facebook organisers and see how we can work with them to engage their audience in the project. Ideally we could then begin interviews late this year and in the early months of next year. Again there is uncertainty as it seems we are not guaranteed that this project will be picked up for the Strategic Media Project. I am mindful of not putting people to the effort of being interviewed if there is no project. How will your audience participate in the narrative? Will they be able to contribute to the narrative, alter the narrative, respond to the narrative? If the final product is a simple web format housing modular content made up of separate videos I think that there should be opportunity for user feedback. This of course raises questions of moderation, replying etc. I think we could only consider this kind of interaction if an agency came on board and was prepared to provide the responses especially around questions specific to homelessness. I don’t think with this work the audience will have the opportunity to alter the narrative as this is not a work where there will be a range of journeys or outcomes to explore.